Steve Reeves stars in a Euro-adventure film from Riccardo Freda, with cinematography by Mario Bava. VCI USA R0 DVD. A Steve Reeves vehicle made during the heyday of the Peplum boom, it is no surprise that despite its more contemporary setting, White Warrior is a Peplum at heart that could quite easily have worked in a Roman era setting with nothing more than a few costume changes. The plot is effective but highly unoriginal and the film as a whole is largely dialogue based with only a couple of brief action scenes. Fortunately despite the resultant slow pacing there is enough going on to keep the film moving and it builds to a god if inevitable (and somewhat rushed feeling) climax. Probably the most interesting aspect of the film is its setting. The 1960s had seen film-makers determinedly searching the world for suitably epic subjects, leading to the unexpected sights of epic Hollywood productions about Spanish Kings (El Cid (1961)) and Chinese rebellions (55 Days in Peking (1964)). Here the inspiration is from Leo Tolstoy's novel 'Hadji Murat' based on the stories he heard about the real historical character, although there is little connection between the film script and either the novel or the real history. It is hard to imagine that a film about a heroic Muslim leader battling Christian invaders would be made in today's climate and even here the film (largely intended for Euro/American distribution) plays down this aspect aside from a few mentions of Allah in character's dialogue. Credited director Riccardo Freda is one of the most awkward characters of the Euro-cult boom - having made plenty of money with his film work in the 1950s and invested it well, his later films were often little more than curiosities to him and it is believed that many of his credited films were largely directed by his assistants including his frequent collaborator Mario Bava - here credited as cinematographer. However unlike many of the films that Bava took over direction of (cf. Giant of Marathon (1959)), White Warrior has none of his usual trademarks or indeed any directoral flair at all and is a thoroughly workman-like production. Probably due to budgetary limitations the exteriors (nicely filmed in Jugoslavia) are limited and there are only a select few action scenes (although the highlight horse charge is well helmed) with most of the film set-bound - although the interiors do look the part, particularly the Russian sets with the typically over-crowded mix of paintings and furniture so typical of the Russian aristocracy. The great Peplum icon Steve Reeves gives another fine performance here and although spending a lot of the film in costume (rather than his classic loin-cloth) he does get an inevitable shirtless fighting scene. The majority of the cast are made up of local Serbian actors and performances are acceptable if unexciting. 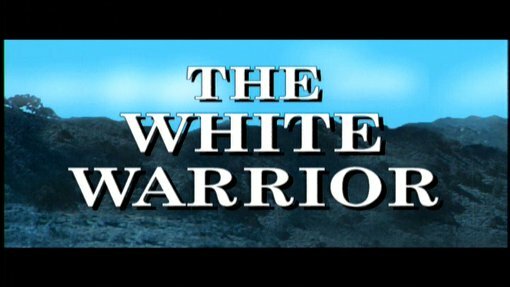 A generic storyline lifted straight out of a Peplum with some rather uninspired direction and a cripplingly low budget that precludes all but a couple of action scenes, White Warrior is made interesting thanks to its unique setting and the ever enjoyable presence of Steve Reeves in the title role. One for fans of Reeves or the Euro-Adventure genre - anyone hoping to find a forgotten Mario Bava directoral effort will probably be disappointed. Who else was involved? Cinematography on the film was by Mario Bava, soon to become famous for his horror films. Any gore or violence ? Nothing vivid. Who is it for? Of interest to fans of Steve Reeves and the Euro-adventure films. While the original print seems to be of good quality, the transfer is poor looking like an old VHS transfer with uncertain colours and a general lack of detail throughout that makes it often very dark. Note: The print is presented in what appears to be 1.85:1 non-anamorphic but is quite stretched and would seem to be better viewed squashed down into a 16x9 screen if your DVD player will allow this (this is how the images in the review above are presented). Audio English mono - generally quite good with only some slight hiss and a little tinny. Other regions? Available on various public domain releases in the US with very low image quality and often fullscreen prints. Cuts? Cut status unconfirmed - the print is as per the Warner-Pathe UK/US release and may well have been edited from the original Italian - English text is used on some letters seen in the film and the opening sequence with voice-over narration feels considerably more like an American production than an Italian one. An rather generic storyline and workman-like direction but Reeves is on typically strong form. Of interest. The print is far from perfect but is watchable and probably the best available print of this film on DVD at present (avoid the other US public domain DVDs). Find our reviews of other films by Mario Bava and Riccardo Freda or starring Steve Reeves. All text in this review written by Timothy Young - 27th December 2010.